Hanging rails, on sloping ceilings are something we have never worked with in the past despite DIY Doctor and its associated building company having completed hundreds of refurbishment projects and many loft conversions. Every customer, on every job has asked the same question. How can we gain more storage space? Until now the answer has usually been odd shaped shelves, in tight little spaces which, while providing some of the answers, fell short of a perfect solution. Enter Zebedee! Probably one of the simplest concepts we have seen but, when coupled with excellent engineering and more than a touch of artistic flair, a product that can solve storage problems in a flash while adding a wow factor to the space. An amazing product that we are very pleased to review. Zebedee hanging rails were invented by a lovely lady called Diane when she was so fed up with hanging her clothes on the floor and on chairs in her loft conversion bedroom. The idea came like a bolt from the blue and very soon the Zebedee hanging rail was born. You can read more about the story on the Zebedee website, but let’s take a look at this great product first. We were building a dressing room in a loft when Zebedee came to us to ask about our views on their any angle hanging rail. They sent us a couple of rails and the moment we took them out of their wrapping it was obvious what a genius invention this was! You can see at a glance what the rails are capable of and what’s more, you can also see that they have been made so beautifully each one almost qualifies as a work of art! The central rail is an immensely strong stainless steel rod which won’t discolour or rust, even in a humid bathroom. 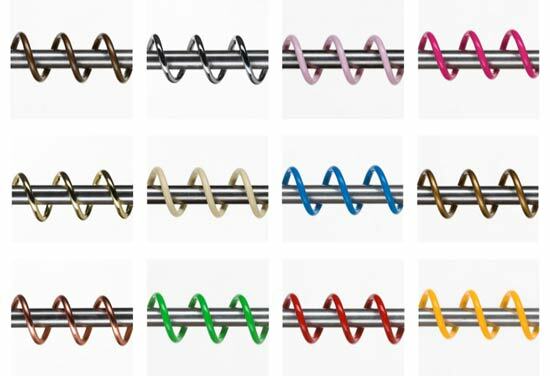 The hanging section is a very strong, powder coated spring in (at the time of writing) 18 different colours. Many of the colours can be seen below or in the shop on the Zebedee website. Fitting the Zebedee hanging rail is simplicity itself and Zebedee have a great step-by-step fitting instruction page on their website. In a nutshell, you screw two brackets to the surface, dropping the Zebedee rail in between them. As you can see, we fitted Zebedee to timber battens which, in turn, were fitted across the underside of the roof trusses in the loft. Were there no plasterboard ceiling, the Zebedee rails could have been fitted to the underside, or even the sides of the trusses. They could also have been fitted to the walls. It really is very very easy to fit these amazing rails and, once fitted, they are as strong as you will ever need them to be. 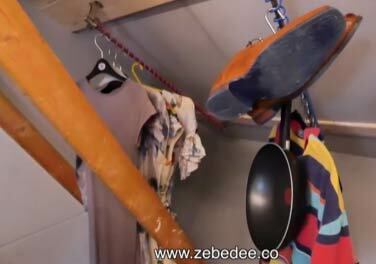 The Zebedee hanging rail is not limited to clothes….This is why we found it to be an amazing storage space solution. With the addition of a few hooks that can be bought at any kitchen shop your Zebedee can become a shoe cupboard, a kitchen cupboard and even a tool cupboard. Usually, clothes rails are a pretty boring affair consisting of a chrome rail in two cups which, at the slightest scratch, start to discolour and even rust. The Zebedee rail, as well as having the facility to fit at anything from 0 to 180 degrees, is positively a work of art. They even look great with nothing on! Brilliant! 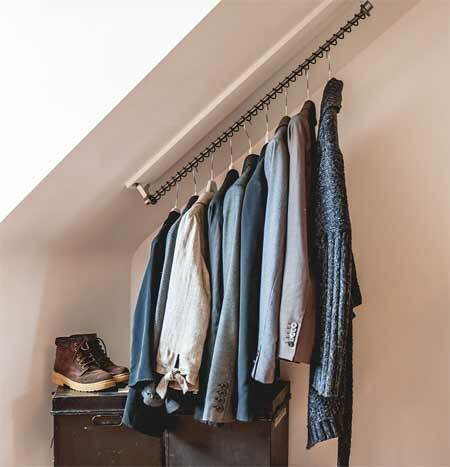 We fitted two of these rails in under 15 minutes and immediately saw that the problems of storing and hanging clothes, in loft spaces was over. A real solution to a problem that has plagued people for years. A very clever idea indeed and we honestly wish Diane and her team the very best of luck in the future. To be honest however, we don’t actually think luck will need to play any part in the inevitable success of this product.